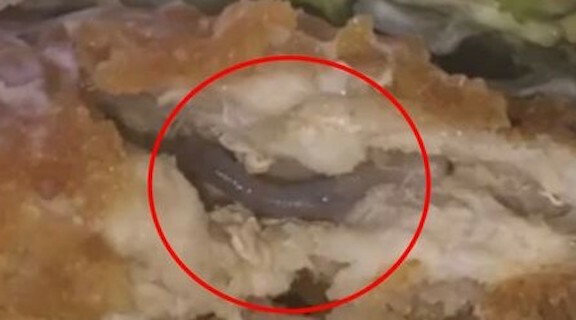 Do You Need More Proof McDonald's Uses Worms In Their Sandwiches? Well, Here You Go! Do You Need More Proof McDonald’s Uses Worms In Their Sandwiches? Well, Here You Go! Last year DBL brought a story about McDonald’s alleged involvement in using worms as a filler in their hamburgers. Another story involved a customer claiming they found a worm in their chicken McNuggets, and another person found a worm in their McMuffin; the list goes on and on. Now, there is another woman claiming to have found worms in her McChicken sandwich. Joyce Fedd claims she discovered two worms in her McChicken sandwich. She says she ordered the food for her and her two children from the McDonald’s drive-through in Jacksonville, Florida. She took a bite, taste something weird, and pulled the worm out of her mouth. She said upon closer inspection, she noticed her sandwich contained a purple worm, followed by another worm. McDonald’s told Action News that the chicken did not come from them, but rather from an independent distributor. You can see her story in the video below!